Reserve by 1/31/6 and receive 2017 rates for 2018!! 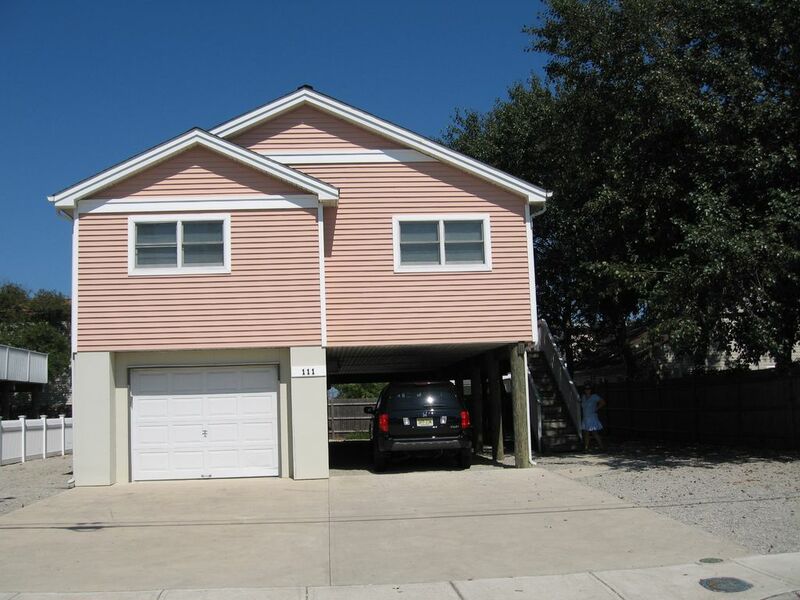 Six year old 3 Bedroom Single Family Home in Ship Bottom on Long Beach Island (LBI) New Jersey just one block from the beach. This beautiful home is ideally located close to the Causeway near restaurants and other family activities. LBI was voted one of the top Five Family Beaches in the USA by National Geographic Traveler Magazine in 2003. This home home is just seven houses from the beach. It is located near shopping and within walking distance to a food stores, CVS drug store, numerous family oriented restaurants, ice cream shops, bike rentals and miniature golf. There is a large wrap around deck with deck furniture plus a roof top deck, outside shower with a dressing area plus plenty of off street parking. The house has a open floor plan with a large cathedral ceiling great Room. This home was tastefully decorated and furnished by a professional designer to provide a relaxed beachy atmosphere. The house has central air and gas heat. have stayed at pink house for 7 yrs. any problems are taken care of right away by cleaning staff or repairman. beach is very close an badges are provided.every thing is close by for family fun. I had an excellent time at this home. I booked it only for a weekend, but I wished that I was able to stay longer. The home was clean and very accommodating. Very close walk to the beach, restaurants, and Wawa. I had a great time grilling all weekend, and the rooftop deck was incredible at night. We had a wonderful time here during our vacation in August of 2010. This home is extremely comfortable, tastefully decorated, and designed with all the essentials in mind. Two baths, easy access to washer and dryer, fantastic kitchen that was stocked with everything, huge wrap-around deck with a very large grill, parking for 4 cars, comfortable beds, and beautiful wood floors. We just loved it. It's just a half block to the beach and convenient to all stores and shopping. Great location. Thanks so much. We really hope to be back soon. Anyone staying here will not be disappointed even if it rains! My family of 7 stayed in the extremely comfortable home in August of 2010. Decorated beautifully, it is very spacious and included all the essentials. We did a lot of cooking here since the kitchen was so well stocked with everything one would need, and there was a huge gas grill on the wrap-around deck. Location was just one half block to the beach - which is wide and clean. Everyone just loved this home! The location was convenient to all the stores, as well as the beach - and we loved the nightly ocean breezes on that fantastic deck. You will just love this house - we did, and plan to come back. Thanks so much. House is 6 to 7 houses from the ocean beach!